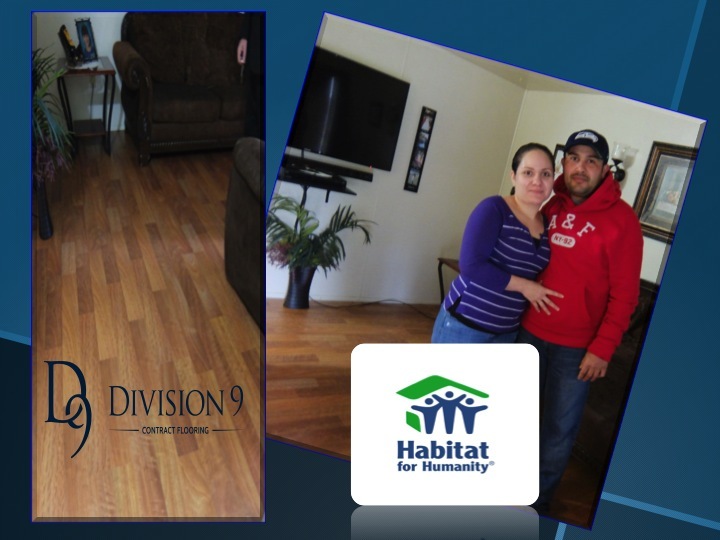 Division 9 Flooring and Habitat for Humanity of Snohomish County formed a partnership last year. Division 9 Flooring has long had an interest in repurposing, recycling (D-9 was honored with the 2015 Re-Innovator Award for waste prevention and recycling) and giving to those in need. Habitat for Humanity is a non-profit Christian housing ministry seeking to eliminate poverty and homelessness. It makes sense that both organizations would come together to help those in need. Since teaming up last year, Division 9 Flooring has donated between $300,000 and $400,000 worth of flooring material to Habitat for Humanity Snohomish County. They have an arrangement that has Habitat for Humanity picking up flooring materials once a month from D-9’s warehouse in Maltby. Habitat for Humanity used some of that flooring for a Habitat home in Everett. Jose Cruz Munoz and his wife Reveca DeLaPaz live in the home with their children Dalia, Jose and Angel. Munoz told us that when they moved in, the carpeting in his kids bedroom smelled like a dog had slept on it. They felt they needed to give their children better flooring and he was able to install flooring on his own. When the living area flooring needed replacing, Habitat for Humanity stepped in and used some of the flooring Division 9 Flooring had recently donated. Habitat for Humanity’s mission is to bring people together to build homes, communities, and hope. Division 9 Flooring is proud to partner with Habitat for Humanity and to be a part of such important work in our community. D-9 is especially proud that most of the donations stay local, right here in Washington State. Habitat for Humanity recently opened a store in Lynnwood. The store is another source of income for Habitat for Humanity of Snohomish County. A portion of the flooring materials donated by Division 9 Flooring are available at the store. You’ll also find appliances, doors, cabinets, roofing materials and more for as much as 50% off. If you’d like to find out how to get involved with Habitat for Humanity click here.